When, in October 1966, Page launched his own Page One label, I Can't Control Myself was its debut release. Penned by Presley, this was probably their finest moment. The lyrics were risque for the era, 'Her slacks are low and her hips are showing', which guaranteed notoriety but limited airplay and the record was virtually banned in Australia. Their first two albums From Nowhere - The Troggs and Trogglodynamite, both made the UK Top Ten and the hits continued to flow. Night Of The Long Grass was different from what had preceded it - giving a nod and a wink to psychedelia both lyrically and musically but Little Girl, released in 1968, was their last UK Chart hit. By now, Britton wanted to leave the group, disillusioned with the whole pop scene, but Presley persuaded him to stay and the band continued to work the club and college circuits until they eventually split in March 1969. Presley recorded a solo 45, Lucinda Lee, as did Bond (Anything For You) and Britton cut an LP, As I Am, but none of their solo ventures met with any success. Back in 1967 they also contributed the Great Shakes Ad to the Great Shakes EP. In 1972 Presley and Bond reformed the band with two new members. 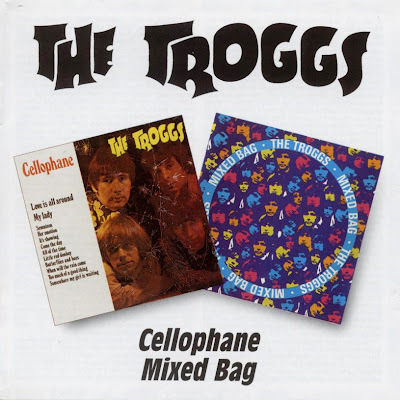 They worked the club and college circuit here in the UK and in Europe and a studio tape made during some of their later Page One sessions surfaced in bootleg form as The Troggs Tapes and revealed some laughably amateurish behaviour. Their live act was as strong and their lyrics as risque as ever as they continued to record. Indeed at the start of 1975 they reunited with Larry Page and covered The Beach Boys' Good Vibrations for his Penny Farthing label. Typically they replaced the line, "I love the purple cloak she wears" with "I love the dress she almost wears", but although they attracted media attention they failed to chart with this or subsequent efforts, which included a cover of The Rolling Stones' (I Can't Get No) Satisfaction. The Trogg Tapes album released by Penny Farthing was unconnected with the earlier bootleg but capitalised on the name because of its notoriety. Rhythm guitarist Colin 'Dill' Fletcher was added to their line-up in July 1979 and in America in particular, the band still enjoyed a cult following. LA band, X, released a cover of Wild Thing and in 1980 The Troggs signed to Basement records releasing Live At Max's Kansas City. Several late seventies punk bands quoted them as an influence and they continued to gig on both sides of the Atlantic well into the eighties.